BETWEEN 1811 and 1813 Pavel Petrovich Svin’in, a Russian diplomat, travelled across eastern America gathering stories and images. The resulting travelogue, “A Picturesque Voyage in North America” (1815), purported to reveal to curious foreigners how Native Americans lived; in truth, Svin’in and his illustrators never witnessed many of the scenes the book depicted. Instead, they drew upon pernicious cultural stereotypes, creating sensational paintings that would stimulate the imaginations of readers abroad. 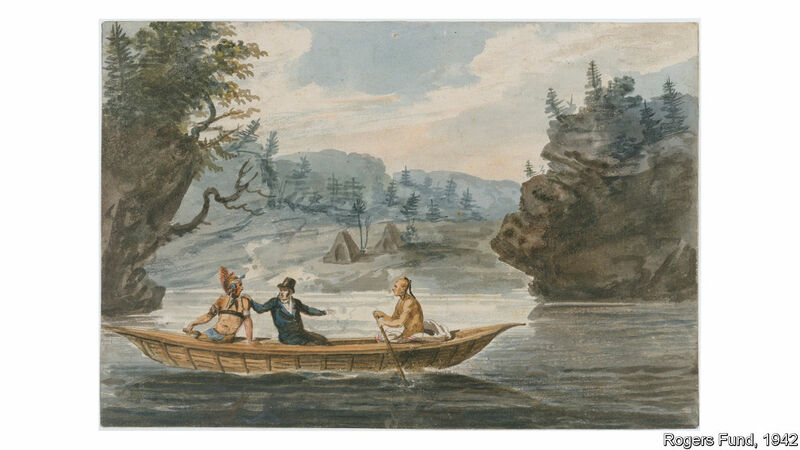 Svin’in’s watercolour of a European man in a top hat grappling with two barely clothed Native American men in a canoe (pictured) powerfully encapsulates the offensive misconception—held by Euro-American societies for centuries—that indigenous American cultures are uncivilised and uncouth. “Artistic Encounters with Indigenous America”, a small but thought-provoking exhibition at the Metropolitan Museum of Art in New York, explores how European artists have depicted Native Americans over the past five centuries. The exhibition begins with efforts to sell the fantasy of America in the 17th century by emphasising the “exotic” qualities of indigenous groups. The “Indian princess”—a beautiful woman covered in animal skins and feathers—was an especially popular trope, seen to embody the independent spirit of the young United States. 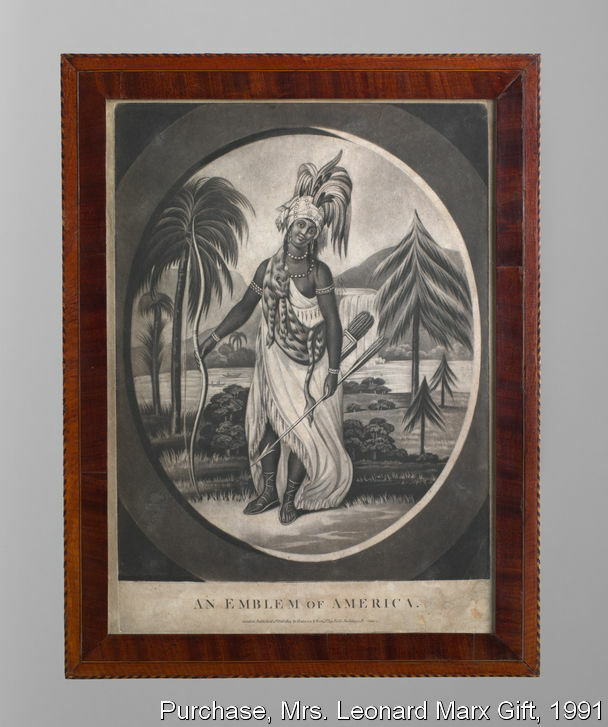 “An Emblem of America” (1801), a print, depicts a woman wearing a leopard skin in a lushly vegetated landscape; the title links the supposedly wild sexuality of indigenous women with the fertility of American soil. By the turn of the 19th century, even as the national government refused to accept Native claims to land and resources, the depiction of America as an “Indian princess” recurred in visual mythology. The exhibition also features images by artists convinced by the notion of a “doomed race”. 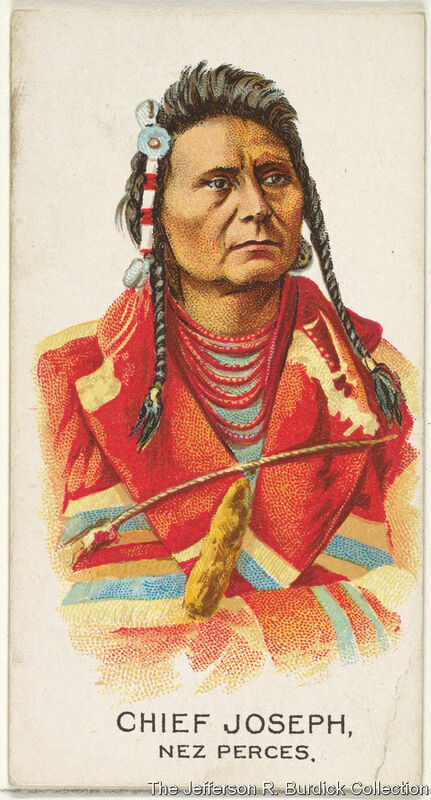 Their subjects were usually tribal chiefs, such as Chief Joseph of the Nez Perce, who campaigned for the return of ancestral lands in the late 19th century. These tragic, romanticised portraits appeared in both ethnographic studies and in advertisements, contributing to the idea of the “noble savage”. On display are collectible Allen & Ginter cigarette packages (1888), showing stoic indigenous chiefs in ceremonial clothing. These promoted a Native American crop—tobacco—which many groups could no longer cultivate due to their forced displacement. By the early 20th century Euro-American artists began to create more humanised portraits. Some members of the Taos creative colony, a group of artists and writers, journeyed around New Mexico and observed Pueblo culture. They recorded scenes of women working on pottery and of local celebrations, which began to be heavily frequented by tourists from the 1920s onwards. While the colony’s work resulted in more naturalistic portrayals and an appreciation of customs, it also contravened the wishes of communities who did not want to be photographed or sketched. Artists such as Gene Kloss and John Marin depicted Pueblo ceremonial dances from memory instead. By juxtaposing troubling images with enlightening interpretative texts from the curators and Wendy Red Star, an indigenous artist, the exhibition offers an arresting examination of non-Native depictions of Native cultures. However, the exhibition’s impact is dulled by its location within the museum. Although it is sensibly placed within the airy American Wing, the exhibition occupies an inconvenient, hard-to-find location: a small mezzanine in the farthest corner of this large building, accessible only through the open archives or via an elevator. A show about a marginalised group exists in the institution’s margins. This exhibition is important viewing, so it is a shame that so few will be able to find it. Harmful stereotypes and gross simplifications about indigenous American culture persist. President Donald Trump has frequently taunted Elizabeth Warren, a senator, about her avowed Native American ancestry with the name “Pocahontas”—considered a racial slur by many indigenous groups. On January 18th a video from the March for Life in Washington, DC, went viral, showing Nathan Phillips, an Omaha tribal elder, being intimidated by a male teenager; the boy, wearing a “Make America Great Again” cap, was encouraged by his friends, who shouted disparaging remarks about Native Americans. It is clear that the attitudes laid bare in “Artistic Encounters with Indigenous America” are not yet consigned to history. Previous PostPrevious Why are Indian farmers angry?